As of Monday, DEBBY had forced Gulf of Mexico oil and gas operators to shut down about half of oil and more than a third of natural gas production. The storm is forecast to dump at least a foot of rain in the coastal parts of the state, with some areas receiving as much as 25 inches, the hurricane center said. Debby is also forecast to drench southern areas of Alabama, Georgia and South Carolina. Tornadoes spawned by DEBBY have killed at least one person and injured two others, destroying or damaging two dozen homes in Highlands County, Fl. TS DEBBY: Tropical Storm Force Wind Speed Probability. Colorado. The state of Colorado is becoming a raging inferno due to record heat which is causing the worst fire weather conditions in living memory. Record heat is forecast for southern Plains this week, with heat advisories issued for Kansas, Oklahoma and Texas. The temperature at Denver International airport reached a record 102 degrees (ºF) on Sunday, June 24, breaking the old record of 100 degrees set in 2007, NWS office in Boulder reported. Waldo Canyon Fire, west of Colorado Springs – 2,800 homes are in immediate danger; 11,000 residents have evacuated 4,000 homes; about 3,500 acres burned; ZERO containment. High Park Fire west of Fort Collins – the second-largest and the most destructive blaze ever recorded in the state has destroyed at least 248 homes; burned 83,205 acres; up to 5,000 people remain evacuated; 45 percent contained. Little Sand Fire near Pagosa Springs, Weber Fire in Montezuma County, State Line Fire southeast of Durango, Treasure Fire near Leadville, Trout Creek Fire near Rainbow Falls in Douglas County, Woodland Heights Fire near Estes Park southwest of the High Park Fire, and Elbert Fire have so far consumed about 30,000 acres. Wood Hollow fire. The blaze about 1 mile south of Fountain Green in Utah State Division of Forestry Fire & State Lands has exploded to about 40,000 acres destroying numerous structures and scores of farm animals, mostly sheep. Evacuations: Up to 2,000 people have been evacuated. Indian Ridge, Elk Ridge, Big Hollow, and Oaker Hills communities are under mandatory evacuation. Closures: Highway 89 closure is in effect. Weather: “The big worry now is the weather. Everything that can be done is being done,” Gov Herbert said in a televised conference. 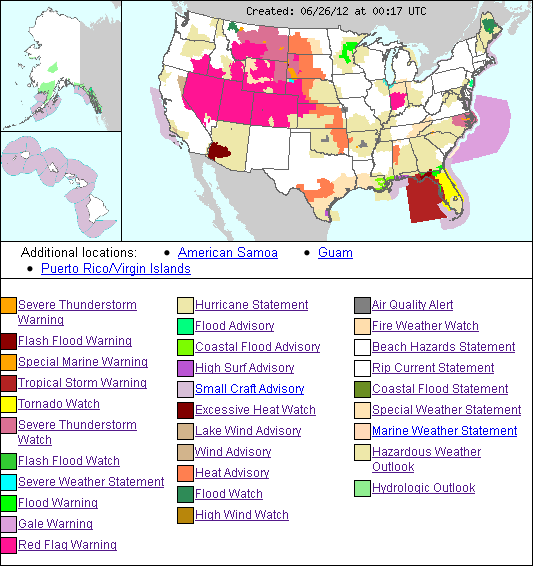 US Weather Hazards Map, June 26, 2012. Meantime, Colorado legislators have asked USDA to open up additional land for emergency livestock grazing as farmers, ranchers battle the severe drought affecting the state, a report said. The entire state of Colorado is currently experiencing abnormally dry or drought conditions. Vermont. Crops in the state of Vermont are under attack by armyworms, a report said. “They are definitely eating, that is what it looks like,” said Heather Darby an agronomist with the University of Vermont Extension. New York. Armyworms have invaded farm fields throughout Jefferson County, NY, with a major outbreak of the worms threatening widespread damage to crops, reports said. “This year, it just seems like the moths got a head start on ’em and that’s what’s happened. So we’re starting to get a buildup of these parasitic flies and these fungal diseases now, but it’s a little, you know, too little, too late right now to control what we’ve got going on now,” said an expert with with Cornell Cooperative Extension. Alaska. The Bear Creek fire which was ignited by lightning about 14 miles south of Clear Airforce Base, AK, on June 23, had grown to about 1,500 acres by Sunday local time. On Monday, the blaze exploded by more than 12 folds, consuming more than 20,000 acres. The fire is aided by strong winds, high temperatures and low humidity, burning in black spruce and hardwoods. At least three other fires are burning within close proximity, fire authorities said. British Columbia, Canada. Weekend storms forced at least 700 people to flee their homes, while 1,200 others were placed on evacuation alert. “Weeks of rapid snowmelt and wet weather caused river levels to rise in the B.C. Interior, the Kootenay region and the Fraser Valley, and a weekend of heavy rain and violent thunderstorms pushed many rivers and creeks in those areas to the brink,” said a report. Flooding has left at least one man dead, causing widespread devastation in the region with many homes, businesses and public infrastructure destroyed. The municipality of Sicamous declared a local state of emergency on Saturday, a report said. Montana. 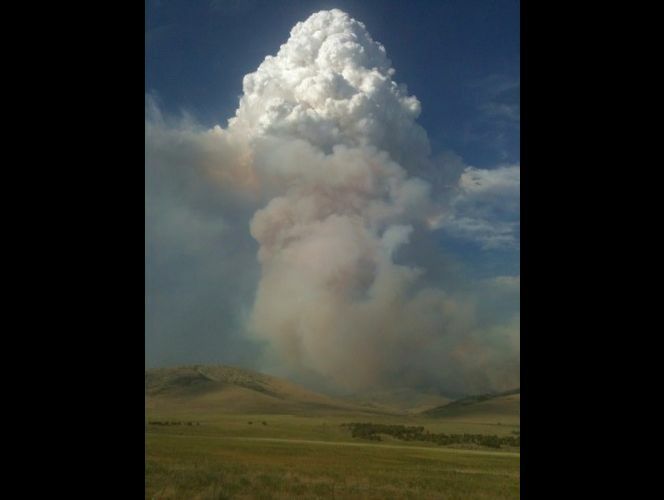 Pony Fire in Beaverhead-Deerlodge National Forest, ignited on June 24th, has grown to more than 2,500 acres threatening numerous structures. The town of Mammoth and South Boulder north to the Indiana University Geology Field Station are under mandatory evacuation, Inciweb reported. At least 2 other wildfires, Antelope Lane fire and Corral fire, are burning nearby.